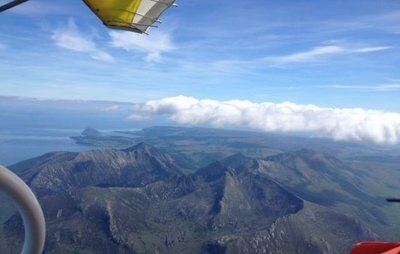 The Extended Microlight Experience, at £199, is suitable for someone who has never flown before, but is mainly aimed at someone who might have been up for a 10 minute flight on holiday or on a corporate day and wants to find out more about microlighting. Or perhaps after flying a glider or a light aircraft, have decided they want to learn to fly and want to try microlights. Or it could be just pure indulgence, as it was for one lady who had dreamt of flying over Tinto Hill! Usually we will fly across country to another airfield, perhaps visiting Cumbernauld Airport or the private landing strips at Carluke or Crawfordjohn. Then, if you want, you can sit on the front for the flight home to Strathaven Airfield and get a really good feel for what it is like flying from the "captain's" seat.